Rudimentary sensors were invented well over a century ago and helped put the first thermostat on the market. More than 100 years later, research shows that creators are still thinking about sensors, but they continue to classify them in a sweeping, monolithic category. These general attitudes about sensors were illustrated in a recent Avnet survey of our element14 and Hackster communities to identify what is essential to product developers. One of the survey’s key takeaways? 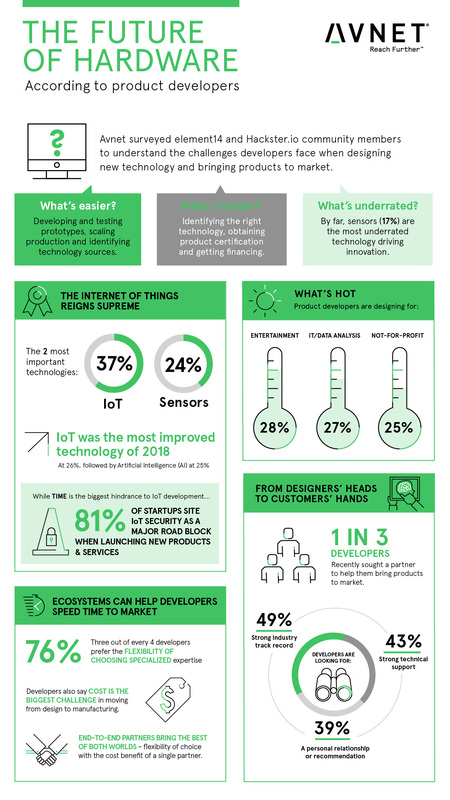 Some 61 percent of respondents said IoT and sensors are the most critical technologies for products they’re designing today. Here’s what startled me the most: the fact that creators are still viewing sensors as the single most underrated technology driving the innovation train. When I read that, I thought: “Wow, developers think sensors are underrated?” There are sensors in almost everything these days, except maybe the coffee you are drinking now (and I can’t even guarantee that). If your business interests touch anywhere within the sensor community, the “underrated” designation is exciting. Why? Because if creators still don’t think that sensors are getting the attention they deserve now, then there really is no limit to where the IoT can go. The only boundaries lie in the imagination of creators, start-ups, and their end-to-end partners. As transformative as technology has been, I think the past 30 years may have just been a warm-up act to the main show which is only just now beginning. Today is an exhilarating time to be occupying this space and to be able access to so much of the technological expertise to transform fantasy into reality. What is happening with sensors now, though, is not uncommon in the life cycle of a product. For instance, for a generation, people thought of supermarket soup as a single category dominated by a red and white label. While that used to be the extent of the conversation on soup, as the category matured, it became clear there was room for other brands and varieties : low sodium, no sodium, vegetarian, spicy, ethnic, large cans, small cans, powders, and packets and on and on. Once it became clear that soup was not just an overarching category but a dynamic, organic area of the supermarket, it became ripe for innovation. The soup trajectory is one that happens with many products; maturity cultivates opportunity. The same will happen and is happening now, with sensors. The time has never been more right for innovation in the category. Sensors can still be viewed at a high level, but the IoT is transforming the way developers think about nuances and how those impact their inventions. As it is becoming more and more clear what sensors can do, and their capabilities mature, the “sensor aisle” will change in much the same way the “soup aisle” has. A developer with a conceptual smart “temperature sensor” isn’t specific enough. Factors like power utilization, motion, distance, and environment are just a few of the scores of considerations that go into developing and, for that matter, choosing a sensor. Plus, have you considered how to integrate that sensor into a power grid built in 1971? Often there are multiple considerations to evaluate beyond the sensor’s primary purpose. This is especially true in environmental projects. According to a survey of 1042 engineers of IoT solutions in 51 countries conducted by Newark element14, environmental sensors are the most commonly used. For instance, if planning an environmental IoT project that is supposed to measure pollutant levels in a drainage ditch to make sure the company complies with emission regulations, a sensor is needed that will operate within the required physiochemical parameters. It needs to be able to measure the particulates but also withstand the possible corrosion from continued exposure to trace amounts of chemicals, possible salinity in the water, algae, and lack of oxygen. The sensor needs to meet target budgetary goals and be able to be integrated into factory technology that predates IoT. All of that takes not just an “environmental sensor” but a very specific type, with specific form factor, temperature and ruggedization considerations. Industrial sensors are close behind environmental sensors in complex deployments. Sensors in factory settings often have equally harsh conditions to endure. Sensors in a steel mill that are measuring oxidation in the metallurgical processes will need to withstand extreme heat. Platinum or a mineral insulated thermocouple that can handle the heat, brings IoT into the heart and hearth of manufacturing. The market for industrial IoT sensors is exploding, and along with it the opportunities for developers and creators. Sensors can collect data and, using AI, interpret data. They can measure pressure and send signals. Sensors can be traffic cops, inventory managers, supply chain monitors, cardiologists, blood pressure monitors, kidney function managers, or even agriculturists, horticulturists and data interpreters—a huge green field for developers willing to dig deep into new sensor applications for a variety of industries. Working with an end-to-end partner, with access to experts that have experience in development, can speed the production cycle and open opportunities faster. We sense it, and your sensor should too.